AI (Artificial Intelligence) face recognition system that informs about a person in front just by wearing it on neck has been developed. It can be linked to a Smartphone and compares a picture of a person with data that is built in. KAIST (Korea Advanced Institute of Science & Technology, Chancellor Shin Sung-chul) announced on the 13th that a research team led by Professor Yoo Hoi-joon of Electric and Electronic Engineering Department and UX Factory (CEO Park Joon-young) co-used Deep Learning algorithm and have developed face recognition system called ‘K-Eye series’ that finds out information of a person that comes up on a Smartphone on its own. Research team has developed AI semiconductor chip called CNNP that uses world’s least amount of electricity and commercialized face recognition system with CNNP into wearable device and dongle product. Wearable device can be linked to Smartphones through Bluetooth while dongle product is used by attaching it to a Smartphone. Strength of K-Eye is that it can continuously perform its ability to recognize faces with 1mW amount of electricity. 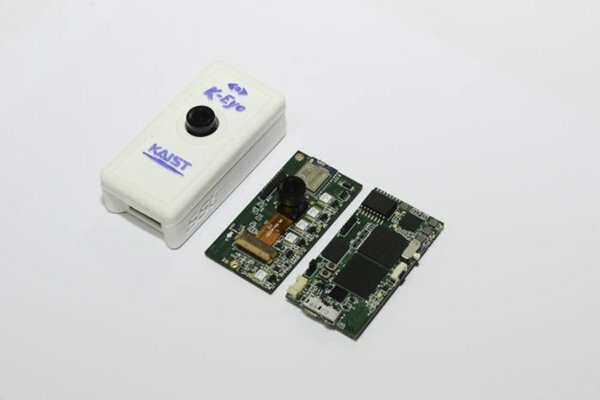 K-Eye uses Always-On image sensor and a face recognition processing chip called CNNP as its major technologies. CNNP chip uses low amount of electricity by changing 2D calculations that are used by AlphaGo’s AI algorithm into 1D calculations and its memories, which are placed as dispersed memories, are designed as special low-powered dispersed memories that can read horizontally as well as vertically. CNNP chip also has a strong calculation ability that can perform 1,024 multiplications and additions at the same time and it can receive and send results of calculations on its own without going through external network. While its recognition rate is at 97%, its electricity consumption is only 0.6mW which is five-thousandth of electricity consumption of AlphaGo GPU. KAIST introduced chip at ISSCC (International Solid-State Circuits Conference), which was held in February in the U.S., and drew interests. Always-On image sensor recognizes presence of a face on its own and greatly reduces electricity that is on standby since it only operates when it is used to recognize faces. It controls digital processing with analog processing and decreases consumption of electricity. While analog process differentiates one’s face from a background while digital processor detects one’s face from a certain area and increases efficiency of work. Smartphone that is equipped with dongle product turns its screen on automatically when person’s face, which is already inputted by dongle product, approaches the screen and provides related information. It also differentiates whether or not an image of a person’s face that is inputted is an image or an actual person.